Ministries of Substance International is a Christ-centered ministry dedicated to Preparing a People unto the Lord! Who will Exalting the Savior; Equipping the Saints; Evangelizing the Brokenhearted and the Lost; and Existing on the Word of the God! Ministries of Substance International are dedicated to joining together all to be followers of Jesus Christ through the successful communication of the covenant promises and provisions of the Lord. A sovereign move of God's Spirit is stirring the hearts of all. In a world of negotiable values, confused identities, and distorted priorities, all are encountering God's Word, embracing their identities as His sons, and investing in meaningful relationships with God, their families and each other. Clearly, Christians have an unprecedented opportunity to seize this moment and make a difference for Jesus Christ. We believe that God wants to use Ministries of Substance International as a spark in His hand to ignite a nationwide movement calling all from all denominational, ethnic, and cultural backgrounds to reconciliation, discipleship, and godliness. To enable the body of Christ to first gain a pure and whole relationship with The Father, Jesus Christ and the Holy Spirit, and once that is established than we can offer a pure relationship and kinship inheritance with all those we come in contact with. To Provide Hope in Hurting; Build and believe in Relationships and Kinship; Tap into John 7:38 ~ “He who believes in Me, as the scripture has said out of his heart will flow rivers of living waters” (Source) and maintain health, purposeful and abundance life. Luke 1:17 And he shall go before him in the spirit and power of Elias, to turn the hearts of the fathers to the children, and the disobedient to the wisdom of the just; to make ready a people prepared for the Lord. Matthew 6:33 But seek ye first the kingdom of God, and his righteousness; and all these things shall be added unto you. Matthew 28:19 & 20 Go ye therefore, and teach all nations, baptizing them in the name of the Father, and of the Son, and of the Holy Ghost: Teaching them to observe all things whatsoever I have commanded you: and, lo, I am with you always, even unto the end of the world. Amen. Who is our Source and Substance? Where is our Source and Substance? Psalm 132:15 ~ I will abundantly bless her provision. Isaiah 6:13 ~ so the holy seed shall be the substance, thereof. Hebrews 11:1 ~ Now Faith is the substance of things hope the evidence of things not seen. Matthew 17:9 ~ Tell the vision to no one until the son of man is risen from the dead. Isaiah 61:1 - 3 ~ The Spirit of the Lord GOD is upon me; because the LORD hath anointed me to preach good tidings unto the meek; he hath sent me to bind up the brokenhearted, to proclaim liberty to the captives, and the opening of the prison to them that are bound; to proclaim the acceptable year of the LORD, and the day of vengeance of our God; to comfort all that mourn; To appoint unto them that mourn in Zion, to give unto them beauty for ashes, the oil of joy for mourning, the garment of praise for the spirit of heaviness; that they might be called trees of righteousness, the planting of the LORD, that he might be glorified. 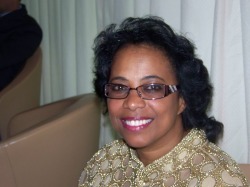 Prophetess Althea Winifred is not just a woman on the move; she is a Woman of God. She is an Evangelist, Prophetess, and Teacher of the Word of God, Writer and Business woman. An Inspirational and Motivational speaker known nationally and internationally, she is Founder and Director of The Intercessor's Network Crowd, known as “The IN Crowd.” The group consists of people in different countries committed to intercessory prayer around the clock 7 days a week. The IN Crowd was established in January 2004. In addition, she is the Founder and Director of Ministries of Substance International (M.O.S.I) and Perfecting of the Saints International Fellowship, Inc (P.O.T.S.I.F) established by God. Althea is also producer, editor and writer of “Into The Clefts of the Rock” ~ Prophetic Magazine, Hope is in the Bag devotional and a creative Hats Maker. She is the author of the following books: The Righteous’ Promises, Healing In Is Your Words, Who Is The She Within You and Who Is The He Within You Study Guides, But for a Moment - An Emotional Abusive Relationship and Birthing it Through Prayer. Althea has a Bachelor Degree in Business Administration with Emphasis in Management and completed her Masters in Religious Education. Althea firmly believes in the Father, Son and Holy Spirit and stands on the Word of the Lord; knowing, that God is God whether the answer is Yes, No or Wait. Her favorite scripture is Ezekiel 12:28 ~ "Therefore say unto them, thus saith the Lord God; there shall none of my words be prolonged (postponed) any more, but the word which I have spoken shall be done, saith the Lord God". People come into our lives for a reason, a season, or a lifetime. One has only one opportunity to impact them for an eternity. Her personal life is that she is a prophetess, and Mum of two children and Grand Mum to two grandchildren. Althea is an EnVisions Events Planner for all occasions, specializing in events for Ministries and Business both local and international. To have a heart after and for God, wanting all to be saved and none to perish! I know all relationships are worth saving but not all relationships want to be saved!